Before you can share scene data between a Mac OS X database and Mac OS X, Linux, and Windows clients, you must configure the Mac OS X database server appropriately. To share scene data between the Mac OS X server and Mac OS X and Linux clients, you must export (using NFS) the database and data directories from the server. Toon Boom Harmony 10.3 uses NFS (Network File System) to share files between Mac OS X and Linux computers. You must use NFS to export directories from the server so that clients can mount them and share the contents. If your Mac OS X server will have Mac OS X or Linux clients, you will need to export the USA_DB and USADATA folders using NFS (network file server). The clients will then need to be configured to mount those exported folders from the server. The following procedure demonstrates how to export the /USADATA and the /USA_DB directories, on a Mac OS X workstation, as NFS Shared points. 1. From Finder go to Application > Utilities and double-click Terminal. 4. Once done, click on [ESC] to exit the insert mode, then type :wq to write the file and exit vi. If there is no return response, then all is correct. 6. Type the following command to start nfsd. The ` character is located on the top left side of the Mac OS X keyboard on the same key as the tilde ~ character. The following should appear after running the command. /USA_DB and /USADATA located on the Mac OS X server system. If Windows clients are going to access the Toon Boom Harmony 10.3 database on a Mac OS X server, you must set up the Link Server, Samba and the server.ini file. These allow the server and clients to communicate and share data. 1. Configure and Start the Link Server. 2. Configure Samba on Mac OS X 10.6 and 10.7. 3. Configure the server.ini File. If you are running Toon Boom Harmony 10.3 in a mixed environment where the server is on Mac OS X and some of the clients are running Windows, you must start the Link Server. The Link Server makes it possible for Windows machines to communicate with the database. 1. If you did not already install Link Server during the server installation, you must do it now. From the Finder, go to Applications > Toon Boom Harmony 10.3 > Tools. 2. Double-click the Configuration Assistant. 3. Select Create the Startup Items and uncheck the other options. 4. Click on the Continue button. 5. In Create Startup Item, select Create Link Server Startup Item. 7. Type a user name and password of a user with administration rights. A message will appear in the Terminal indicating that the script has been successful. 10. A log file will be generated in /Library/Logs/ToonBoomLinkServer.log. Check this file to make sure there are no errors written to this file. Mac OS X 10.7 (Lion) no longer uses the open source Samba software to share folders for Windows workstations. It has been replaced by Apple's own Windows file sharing software. This software does not include some of the options required to support Windows Harmony clients. We are seeking a solution to this problem. In the meantime, if you need to have Windows clients in your environment, Mac OS X 10.6 or a Linux server can be used. 2. In the Internet & Wireless section, click on Sharing. 3. In the Services section, click in the File Sharing checkbox. 4. Under the Shared Folders section, click on the plus + sign. 5. Browse and select the /USA_DB folder. 6. Repeat Step 4 and Step 5 for the /USADATA folder. 7. Make sure to give the usabatch account Read and Write permissions to the USA_DB and USADATA folders. 8. Click on the Options button. 9. 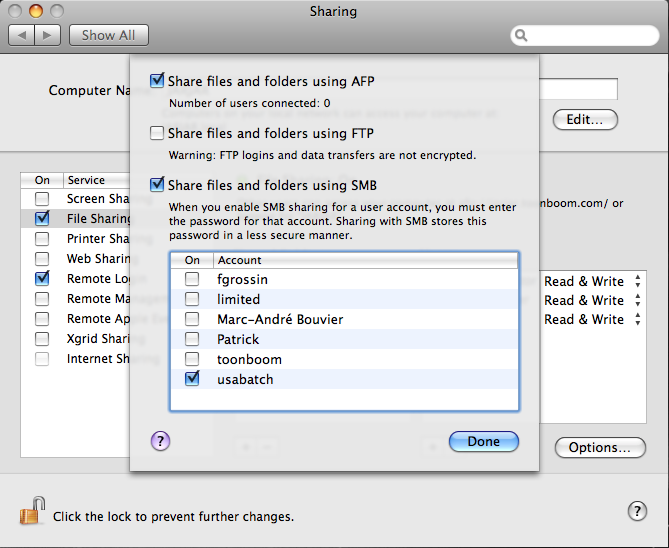 Enable the Share files and folders using SMB checkbox. 10. Click the usabatch account checkbox in the account list and then click Done. 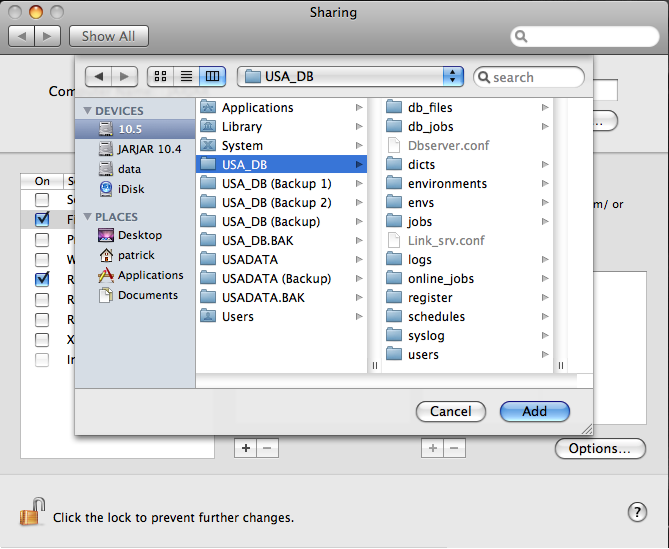 Next, modify the usa_db and the usadata shares in the /var/db/samba/smb.shares and add a usasection to the file. 2. 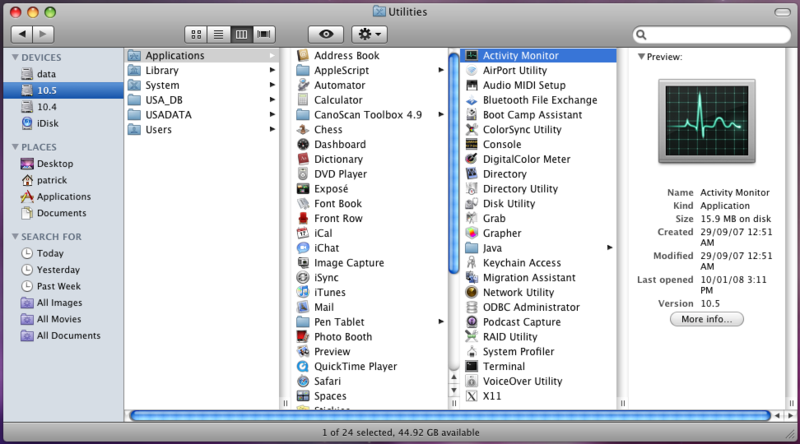 In the Finder go to Application > Utilities and double-click Terminal. 4. Open the smb.shares file in the vi text editor. 5. Type "i"  to enter the insert mode. 6. Add or modify options in the file. This is an example of entries in the smb.shares shared file. You can add missing options at the end of the list. 7. Create a usa share by making a copy of the [USA_DB] section and pasting it underneath. 8. Rename [USA_DB] for [USA]. 11. Type [ESC] and type :wq to save the changes and quit the vi editor. You must also either add or modify the following entries to the [global] section of /etc/smb.conf file. 13. Open the smb.conf file in the vi editor. 14. Type "i" to enter the insert mode. When set to no, the mangled name parameter will prevent older smb clients (DOS, Win9X and Windows NT clients) to access files and folders that do not use a 8.3 file name. 16. Type [ESC] [escape] to quit the insert mode. 17. Type :wq to save the changes and quit the vi editor. 18. Once the file is saved, run the testparm command to check that you have not made any basic syntactic errors. The ` character is located on the top left side of the Mac OS X keyboard on the same key as the tilde ~ character. Or simply reboot the computer. Before you install Toon Boom Harmony 10.3 on Windows clients, you must create the server.ini file on the server. The server.ini file provides information necessary in Windows for the Configuration Wizard to set up a Windows client. When creating the server.ini file, be attentive to spelling, character spacing and case. 1. In Finder, go to Application > Toon Boom Harmony 10 > Tools and double-click the Configuration Editor. 2. When the Configuration Editor opens, click on the server.ini tab. This is an example of the server.ini file. In this example, the server name is harmonyserver and there is one usadata directory named, USADATA. The references to DriveC shown in this example are necessary for Windows clients and will be ignored by Mac OS X. 4. Save the file using the Save command under the File menu and quit the Configuration Editor. At this point, you should reboot the server so that all of the services which you have just configured will start up.